Aim To conduct a systematic review in order to compare adverse effects (AE) and the reporting of harm in randomised controlled trials (RCTs) and non-RCTs evaluating intravitreal ranibizumab and bevacizumab in age-related macular degeneration. Methods Medline, Embase and the Cochrane Library were searched with no limitations of language and year of publication. Studies which compared bevacizumab or ranibizumab as monotherapy with any other control group were included. Case series were included if they met predefined quality standards. Results The 2 year results of phase III trials evaluating ranibizumab show that the rates of serious ocular AE were low (≤2.1%) but indicate major safety concerns (RR 3.13, 95% CI 1.10 to 8.92). A possible signal with regard to thromboembolic events (RR 1.35, 95% CI 0.66 to 2.77) and a significant increase in non-ocular haemorrhage (RR 1.62, 95% CI 1.03 to 2.55) were also noted. In contrast to ranibizumab trials, the RCTs evaluating bevacizumab are of limited value. The main shortcomings are small sample sizes and an apparent lack of rigorous monitoring for AE. A critical assessment of the large number of published case series evaluating bevacizumab also shows that no reliable conclusions on safety can be drawn using this study design. Therefore, any perception that intravitreal bevacizumab injections are not associated with major ocular or systemic AE are not supported by reliable data. Conclusion The bevacizumab studies show too many methodological limitations to rule out any major safety concerns. Higher evidence from ranibizumab trials suggests signals for an increased ocular and systemic vascular and haemorrhagic risk which warrants further investigation. Despite lacking evidence, most published reviews agree that bevacizumab seems to be similar to ranibizumab, effective in maintaining visual acuity. However, the safety and tolerability of bevacizumab in comparison to ranibizumab have not been adequately assessed and hence, the crucial question whether the existing safety data justify the widespread intravitreal off-label use of bevacizumab has not yet been answered. Moreover, it is essential to assess differences in reporting of harm between well controlled phase III studies, RCTs which do not fulfil phase III study requirements, and non-RCTs. In particular, a critical assessment of the large number of published case series evaluating bevacizumab will show to what extent they can be used as a substitute for high quality trials. We searched Medline (Ovid), Embase and the Cochrane Library from inception until March 2008. An update search focusing on RCTs was carried out in August 2009. The search strategy was based on combinations of medical subject headings (MeSH) and keywords and was not restricted to specific languages or years of publication. The search strategy used in Medline is presented in appendix A. Search strategies for other databases were modified to meet the requirements of each database. The searches were supplemented by handsearching the bibliographies of included studies and reviews and by contacting the pharmaceutical manufacturer (Genentech) of ranibizumab and bevacizumab. Currently conducted RCTs comparing Avastin and Lucentis were searched both in the register for clinical trials (http://clinicaltrials.gov/) and in the WHO International Clinical Trials Registry Platform (http://www.who.int/ictrp/en/). Included were RCTs and non-RCTs which compared intravitreal bevacizumab or ranibizumab as monotherapy with any other treatment in patients with neovascular AMD. Case series were included if they enrolled a minimum of 10 patients and met predefined quality standards; that is, the publication had to provide adequate information regarding patient selection criteria or the selection of patients had to be consecutive. Studies which included patients with indications other than exudative AMD, patients previously treated with VEGF inhibitors or patients receiving systemic anti-VEGF therapy were excluded. Titles and abstracts were reviewed using the above mentioned selection criteria. Full papers of appropriate studies were obtained for detailed evaluation. Data extraction and quality assessment was carried out after a modified evaluation tool of the Centre for Reviews and Dissemination.9 Information on the number of participants, ascertainment of exposure (eg, dosage and frequency of drug administered), follow-up time, definition of expected adverse effects, method used to collect adverse effects data, ascertainment of outcomes (ocular and systemic adverse effects) and transparency of patient flow were abstracted. All stages of study selection, data extraction and quality assessment were done independently by two reviewers (CS and CE, or CS and ML). Any disagreement was resolved by discussion and consensus. Ranibizumab data were analysed using the R software.10 This program was used to compute statistics and generate forest plots to compare safety outcomes in different treatment arms. A χ2 test (p<0.05) and an I2 test were used to test for statistical heterogeneity between studies. We used the fixed effects model (Mantel–Haenszel method) in the meta-analysis of rare events as it has been shown to be the more appropriate and less biased approach compared to the random effects model.11 A narrative summary was provided for data that were unsuitable for pooling (studies evaluating bevacizumab). Figure 1 shows the numbers of studies identified at each stage of the systematic review. After removing duplicate references, the searches identified 3628 citations. The inclusion criteria were met by four RCTs 6 12–14 (11 publications 5 6 12–20) evaluating ranibizumab versus PDT, sham or usual care with a total of 1392 patients, and four RCTs 21–24 (five publications 21–25) evaluating bevacizumab versus PDT with or without triamcinolone with a total of 287 patients. In addition, 17 case series 26–42 examining bevacizumab, including a total of 1790 patients, were analysed. In total 11 prospective 26–36 and six retrospective 37–42 case series evaluating bevacizumab were analysed (table 2). The number of included patients ranged between 13 and 625 (median 48). Minimum follow-up time was one month and maximum follow-up 12 months. The patients received between one and four injections and the applied dosage of bevacizumab varied between 1.0 mg and 2.5 mg. In 10 case series 27 30 33 35 36 38–42 patients were injected pro re nata, in three case series 26 31 37 a single injection of bevacizumab was given, and in four case series 28 29 32 34 injections at intervals of 4 or 6 weeks were administered. Funding sources were specified in nine publications.29–31 33–35 38 39 41 A pharmaceutical sponsor was, however, not reported. Intravitreal ranibizumab injections have been associated with endophthalmitis (≤2.1%), uveitis (≤1.3%), retinal detachment (≤1.5%), retinal tear (≤1.9%), vitreous haemorrhage (≤8.0%) and traumatic lens damage (≤0.4%) (table 3).6 12 14 A pooled analysis on serious ocular adverse effects indicated some major safety issues (RR 3.13, p=0.03, figure 2A). In addition, all trials reported a transient increase in intraocular pressure in the study eye after intravitreal injections. Forest plots of ranibizumab (any dose vs any control) for different safety outcomes. The rate of non-ocular adverse effects of single RCTs are displayed in table 5 and pooled analysis for different systemic outcomes in figure 2B–D. The rate of key arterial non-fatal thromboembolic effects (myocardial infarction and stroke) during the first and second year of the ANCHOR12 and MARINA6 trials was numerically, but not statistically significantly higher in the 0.5 mg arm than in the control arm (3.6%12 and 2.5%,6 respectively vs 1.4% and 0.8%, respectively). However, a pooled analysis indicated that there may be a safety signal (RR 1.35, 95% CI 0.66 to 2.77). 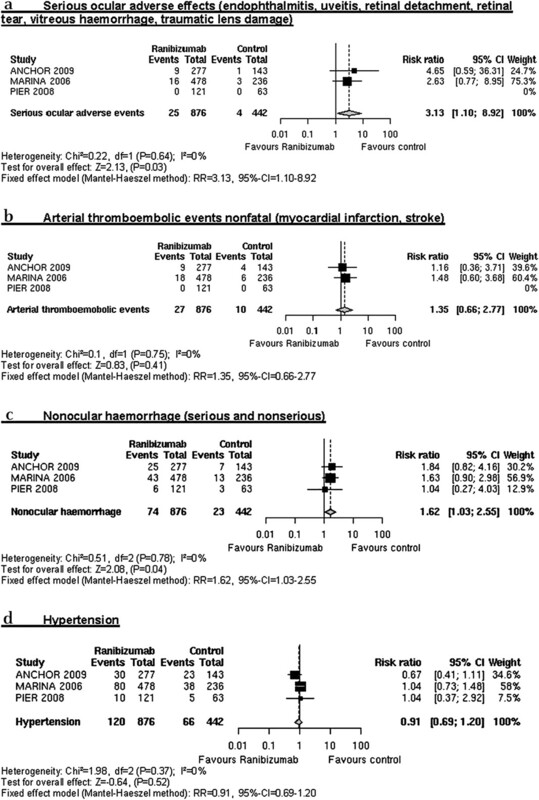 In the ANCHOR,12 MARINA6 and PIER13 studies, the incidence of serious non-ocular haemorrhage (such as gastrointestinal haemorrhage, traumatic subdural haematoma and duodenal ulcer haemorrhage) was also consistently higher in the ranibizumab than in the control groups (2.9% (0.3 mg),12 2.1% (0.5 mg)6 and 0.6% (0.5 mg)13 vs 0.7%, 0.8% and 0.0%). A pooled analysis indicated that this risk reached the standard thresholds for statistical significance (RR 1.62, p=0.04). Treatment-emergent hypertension was not more common in the ranibizumab than in the control groups.6 12 13 In the safety study of Heier, non-ocular adverse effects were not specified.14 However, it was reported that the only non-ocular adverse event judged by an investigator to be a possible effect of ranibizumab was a case of metallic taste in the mouth. Intravitreal bevacizumab injections were apparently not associated with any systemic adverse effects in the existing RCTs (table 5). This assumption is based on the following limited details concerning the harms reported within the articles. Two trials mentioned generically that no systemic effects were observed.21 24 One study did not mention systemic complications in the results.23 Another study reported that no thromboembolic events were observed.22 Other non-ocular complications were not mentioned in this study. Non-ocular adverse effects were observed in one retrospective case series (table 6).42 The incidence of cerebrovascular accidents and myocardial infarct was 0.3% and the incidence of acute hypertension was 1.5%. In addition, 0.6% of patients with exudative AMD showed an iliac artery aneurysm. Overall, eight case series mentioned—by using numerical data—that no thromboembolic events occurred.28–30 34–36 38 41 Six publications stated briefly that no systemic adverse effects were observed (except that blood pressure was reported in more detail) 26 27 31–33 39 and two publications did not mention systemic complications.37 40 However, the primary study goal of these two case series was ocular complications. The methodological quality of RCTs evaluating ranibizumab and bevacizumab is presented in table 7. In contrast to the pharmaceutical industry sponsored RCTs evaluating ranibizumab, the results of the RCTs evaluating bevacizumab are of limited value. The main limitations stemmed from the lack of any description as to how adverse effects were rigorously monitored, as well as the inadequate reporting of actual events. For example, none of the RCTs evaluating bevacizumab defined the method used to collect adverse effects data sufficiently or provided an adequate definition of expected adverse effects. In addition, in two of four RCTs evaluating bevacizumab the follow-up time was not sufficient to assess potential negative systemic effects, such as death or thromboembolic events (less than 6 months).22 23 In contrast, RCTs evaluating ranibizumab showed follow-up times of up to 24 months.6 12 Besides the above mentioned shortcomings, the sample size for bevacizumab treated patients was much lower than for ranibizumab treated patients (112 vs 941) and the number of received injections differed greatly (bevacizumab: 1–7 intravitreal injections per patient; ranibizumab: ≤24 injections per patient). A critical assessment of the large number of published case series showed that no reliable conclusions on safety can be drawn using this study design (table 8). For example, of 11 prospective case series including 501 patients, only two evaluated more than 100 patients.30 35 However, the loss to follow-up was 60–70% and reasons for drop-outs were not given in these publications. In addition, more than half of the evaluated case series did not describe whether all of the originally included patients were considered in the results (transparency of patient flow not given).26 28 30 34 35 37–41 Similar to RCTs evaluating bevacizumab, only four 31 37 39 40 of 17 case series provided a definition of expected adverse effects, and three 27 39 41 (partly) defined the method used to collect adverse effects data. The currently available safety data from case series are—similar to the data from RCTs—further limited by the low number of received bevacizumab injections and short follow-up times. Our review indicates that funding may not be a major cause of bias in the reporting of safety data.43 For example, most RCTs evaluating ranibizumab have been sponsored by the pharmaceutical industry, but they fulfil most of the criteria of reporting adverse effects. The study results of ranibizumab show a potential risk of serious adverse effects related to the injection procedure. In addition, the pooled RR indicates a possible risk of arterial thromboembolic and non-ocular haemorrhagic events following intravitreal use of ranibizumab. Since the trials were not powered to detect small differences in adverse event rates, no conclusion can be drawn regarding whether these differences were drug-related or due to chance alone. Therefore, these signals should be investigated in larger epidemiological studies. Despite adequate reporting of adverse effects in RCTs evaluating ranibizumab, uncertainties remain in pharmaceutical industry sponsored trials about the interpretation and conclusions of these effects by the authors.43 In addition, very rarely adverse effects could not be evaluated in the ranibizumab trials because the number of patients was still too small. In contrast to the RCTs evaluating ranibizumab, the trials evaluating bevacizumab were not sponsored by the pharmaceutical industry. However, they show—as described above—common methodological weaknesses (eg, short follow-up times, small sample sizes, and an inadequate reporting of adverse effects). Thus, the findings that intravitreal bevacizumab injections are not associated with major ocular or systemic adverse effects are not supported by reliable data from RCTs. Beside RCTs, numerous case series evaluating bevacizumab have been published. Not surprisingly, they show major methodological weaknesses and are of limited validity. For example, the often cited retrospective multicentre PACORES study,42 which is the only publication that provides information on the rates of systemic adverse effects of intravitreal bevacizumab, reports ‘self-reported’ harm data. This can lead, as also discussed by the study authors, to an underestimation of adverse effects. Some case series showed a high loss to follow-up without giving reasons for drop-outs.30 35 However, a complete follow-up is necessary in order to determine if those patients who withdrew due to adverse effects are different from those who did not adhere. Taking also into account that intravenous bevacizumab for the management of colorectal cancer is associated with major systemic adverse effects, the low (or zero) rates for intravitreal bevacizumab are questionable—even though the dose of intravitreal bevacizumab is about 0.25% of that used for intravenous treatment. Both RCTs and non-RCTs (in particularly case series) were considered for the current review. We were interested in data from non-RCTs, because it is assumed that safety data from this study type are more reliable than data from RCTs.44 For example, in RCTs, data on adverse effects could be underestimated mainly due to the inclusion of highly selected (non-representative) patients and/or publication bias.45 In addition, small sample sizes limit the ability to detect rare but serious adverse effects.45 In contrast, non-RCTs often utilise large databases, therefore it is more likely that rare adverse effects for a wide range of patients can be detected with this study type.45 However, the current literature shows that in the case of bevacizumab in AMD, no well conducted non-RCTs with large sample sizes have been published. 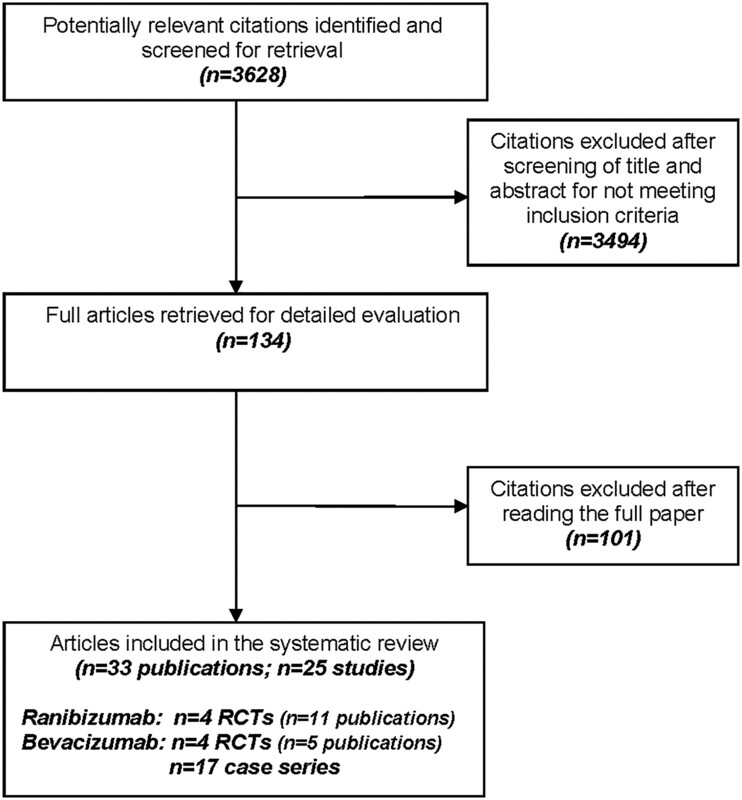 Up to now, ranibizumab and bevacizumab have been evaluated in several systematic reviews. However, the published reviews focused on the beneficial effect or clinical effectiveness of VEGF inhibitors without adequately addressing adverse effects.46–48 The reason is that due to an ongoing methodological debate about the assessment of adverse effects, the conclusions on safety are more complicated and need a very thorough and often time-consuming evaluation. However, it is obvious that the inadequacies of the bevacizumab safety data may potentially lead to situations where bevacizumab is used inappropriately or where patients are not fully informed of possible harm and potentially avoidable adverse consequences49—in contrast to the clear safety information that is available with the licensed substance which has been evaluated in phase III trials. This review highlights that the perceived low rates of adverse effects for bevacizumab are not supported by reliable data. The published RCTs and case series evaluating bevacizumab are of limited value, and therefore they cannot be used as substitutes for high-quality trials. In addition, higher evidence from ranibizumab trials suggests signals for an increased ocular and systemic vascular and haemorrhagic risk which warrants further investigation. Results of ongoing head-to-head studies such as the IVAN study in Great Britain and the CATT study in the USA are in progress. Besides evaluating efficacy, these studies should have enough power to address major safety issues of bevacizumab compared to ranibizumab. Initial study results are expected to be available by 2011. In the meantime, patients and doctors should be aware of the insufficient safety data regarding intravitreal bevacizumab. We are grateful to Dr Gerta Ruecker for providing us with statistical support.
. Age-related macular degeneration is the leading cause of blindness. JAMA 2004;291:1900–1.
. The framingham eye study: I. Outline and major prevalence findings. Am J Epidemiol 1977;106:17–32.
. Age-related macular degeneration and blindness due to neovascular maculopathy. Arch Ophthalmol 1984;102:1640–2. U.S. BLA (BL125156). Ranibizumab injection, Genentech, Inc. LUCENTIS™ (ranibizumab injection). Initial U.S. Approval 2006. http://www.accessdata.fda.gov/drugsatfda_docs/label/2006/125156lbl.pdf (accessed 01 Feb 2010).
. The price of sight - ranibizumab, bevacizumab, and the treatment of macular degeneration. N Engl J Med 2006;355:1409–12.
. Optical coherence tomography findings after an intravitreal injection of bevacizumab (Avastin) for neovascular age-related macular degeneration. Ophthalmic Surg Lasers Imaging 2005;36:331–5. Centre for Reviews and Dissemination. Systematic reviews of adverse effects. In: Khan KS, ter Riet G, Glanville J, et al., eds. Undertaking systematic reviews of research on effectiveness: CRD's guidance for those carrying out or commissioning reviews. York: University of York, 2001. R Development Core Team. R: A language and environment for statistical computing. Vienna, Austria. 2008. ISBN 3-900051-07-0. http://www.R-project.org (accessed 12 Dec 2009).
. Much ado about nothing: a comparison of the performance of meta-analytical methods with rare events. Stat Med 2007;26:53–77.
. Ranibizumab versus Verteporfin Photodynamic Therapy for Neovascular Age-Related Macular Degneration: Two-Year Results of the ANCHOR Study. Ophthalmology 2009;116:57–69.
. Randomized, Double-Masked, Sham-Controlled Trial of Ranibizumab for Neovascular Age-related Macular Degnereation: PIER Study Year 1. Am J Ophthalmol 2008;145:239–48.
. Ranibizumab for treatment of neovascular age-related macular degeneration: a phase I/II multicenter, controlled, multidose study. Ophthalmology 2006;113:633–42.
. Ranibizumab for predominantly Classic Neovascular Age-related Macular Degneration: Subgroup Analysis of First-year ANCHOR Results. Am J Ophthalmol 2007;144:850–7.
. Improved vision-related function after ranibizumab vs photodynamic therapy: a randomized clinical trial. Arch Ophthalmol 2009;127:13–21.
. Responsiveness of NEI VFQ-25 to changes in visual acuity in neovascular AMD: validation studies from two phase 3 clinical trials. Invest Ophthalmol Vis Sci 2009;50:3629–35.
. MARINA Study Group. Subgroup analysis of the MARINA study of ranibizumab in neovascular age-related macular degeneration. Ophthalmology 2007;114:246–52.
. Angiographic and Optical Coherence Tomographic Results of the MARINA Study of Ranibizumab in Neovasuclar Age-Related Macular Degeneration. Ophthalmology 2007;114:1868–75.
. Improved Vision-Related Function After Ranibizumab Treatment of Neovascular Age-Related Macular Degeneration. Arch Ophthalmol 2007;125:1460–9.
. Intravitreal bevacizumab versus verteporfin and intravitreal triamcinolone acetonide in patients with neovascular age-related macular degenereation. Ophthalmologe 2007;104:588–93.
. Randomised clinical trial of intravitreal Avastin vs photodynamic therapy and intravitreal triamcinolone: long-term results. Eye 2009;23:2223–7.
. Intravitreal bevacizumab (Avastin) therapy versus photodynamic therapy plus intravitreal triamcinolone for neovascular age-related macular degeneration: 6-month results of a prospective, randomised, controlled clinical study. Br J Ophthalmol 2008;92:356–60.
. Intravitreal bevacizumab therapy for neovascular age-related macular degneration: a pilot study. Graefe's Arch Clin Exp Ophthalmol 2007;245:651–5.
. Intravitreal bevaizumab (Avastin) for occult choroidal neovascularization in age-related macular degnereation. Graefe's Arch Clin Exp Ophthalmol 2007;245:941–8.
. Intravitreal Bevacizumab for the Management of Choroidal Neovascularization in Age-related Macular Degeneration. Am J Ophthalmol 2006;142:1–9.
. Intravitreal bevacizumab for treatment of neovascular age-related macular degeneration: a one-year prospective study. Am J Ophthalmol 2008;145:249–56.
. Intravitreal Bevacizumab (Avastin) for Neovascular Age-related Macular Degeneration: A Short-term Study. Am J Ophthalmol 2007;143:510–12.
. Standardized visual acuity results associated with primary versus secondary bevacizumab (Avastin) treatment for choroidal neovascularization in age-related macular degeneration. Retina 2007;27:701–6.
. Early effects of systemic and intravitreal bevacizumab (Avastin) therapy for neovascular age-related macular degeneration. Klin Monatsbl Augenheilkd 2006;223:822–7.
. Intravitreal bevacizumab therapy for choroidal neovascularization secondary to age-related macular degeneration: 6-month results of an open-label uncontrolled clinical study. Eur J Ophthalmol 2007;17:230–7.
. Intravitreally administered bevacizumab (Avastin) in minimally classic and occult choroidal neovascularization secondary to age-related macular degeneration. Graefe's Arch Clin Exp Ophthalmol 2007a;245:68–73.
. Intravitreal bevacizumab (Avastin) in treatment of neovascular age-related macular degeneration. Coll Antropol 2007b;31(Suppl 1):S315–9.
. Retinal pigment epithelial tears after intravitreal bevacizumab injection for predominantly classic choroidal neovascularization. Eur J Ophthalmol 2007;17:992–5.
. Submacular haemorrhages after intravitreal bevacizumab for large occult choroidal neovascularisation in age-related macular degeneration. Br J Ophthalmol 2008;92:210–12.
. Intravitreal bevacizumab (Avastin) for the treatment of choroidal neovascularization in age-related macular degeneration: reults from 118 cases. Br J Ophthalmol 2007;91:1716–17.
. Twelve-month safety of intravitreal injections of bevacizumab (Avastin): results of the Pan-American Collaborative Retina Study Group (PACORES). Graefe's Arch Clin Exp Ophthalmol 2008;246:81–7.
. Is there evidence for biased reporting of published adverse effects data in pharmaceutical industry-funded studies? Br J Clin Pharmacol 2008;66:767–73.
. Assessment of adverse effects and applicability - two areas not (yet) covered adequately in Cochrane reports. Z Evid Fortbild Qual Gesundhwes 2008;102:497–502.
. Assessing harms when comparing medical interventions: AHRQ and the Effective Health-Care Program. J Clin Epidemiol 2010;63:502–12.
. Antiangiogenic therapy with anti-vascular endothelial growth factor modalities for neovascular age-related macular degeneration. Cochrane Database Syst Rev 2008;2:CD005139.
. A systematic review on the effect of bevacizumab in exudative age-related macular degeneration. Graefes Arch Clin Exp Ophthalmol 2009;247:1–11.
. Anti-vascular endothelial growth factor pharmacotherapy for age-related macular degeneration: a report by the American Academy of Ophthalmology. Ophthalmology 2008;115:1837–46.
. Cochrane Adverse Effects Methods Group. Systematic reviews of adverse effects: framework for a structured approach. BMC Med Res Methodol 2007;7:32. Funding German health insurance fund (Verband der Ersatzkassen e. V. (vdek), Askanischer Platz 1, D-10963 Berlin, Germany).